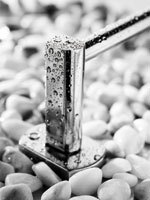 Since 1968 we design solutions for the bathroom manufactured exclusively from stainless steel. We have organized our products in 5 Collections covering all bathroom needs. Each collection is divided into Product Series so that you can easily choose the design and feel that suits your needs. Each series has all the Product Categories needed in the everyday use of the bathroom. Complete collection of bathroom accessories, made from AISI 304 stainless steel. Available in 8 series to suit classic and modern design environments. Complete collection of mirrors, made from 5mm crystal and AISI 304 stainless steel. Available in 5 series in a big variety of dimensions and designs. Mirror heaters can be installed to keep the mirrors dry, after a hot shower. Complete solutions to divide the bath or shower area. Designed to keep the rest of the room dry after a bath or a shower. The range has bath screens, made of 8mm security crystal and mounting system of AISI 304 stainless steel and rods with shower curtains. Complete range of bathroom equipment specially designed for the disabled and elder people. Manufactured from AISI 304 stainless steel with mounting system that can support up to 400kg. Complete range of equipment for the public washroom. Heavy duty equipment made from AISI 304 stainless steel. Wall mounted and recessed models available.